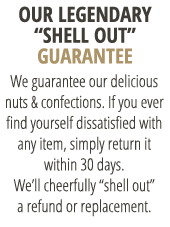 For more than three-quarters of a century, our Super Extra Large Virginia Peanuts have set the standard for excellence. Selected from the top two percent of the peanut crop, the peanuts are cooked to perfection then lightly salted. One taste and you'll agree our reputation for quality is well deserved. 18 oz. can. So crisp and crunchy. the taste is great too! VA Diner peanuts are the best there is. They are big and crunchy. I will not eat any other peanut than VA Diner. I given the various kinds of peanuts as gifts and everyone loves them especially the chocolate covered. Love your peanuts!! They remind us of our days when we lived in Virginia. Everyone enjoyed the salted peanuts. It wouldn't be a holiday without them. Jan 4, 2017 | By Catherine G.
A friend told me about Virginia Diner peanuts, but I thought "what's the big deal?" I found out what the big deal was when I had some. These are freshest peanuts I've ever had! They really crunch because they are not stale or drowning in oil. They do not leave an oily residue on your fingers or in your mouth. Hands down, these are the best peanuts! Had these peanuts when I visited my son in Virginia. Loved them so much I had to order them directly. Without doubt, the best peanut I have ever had both in texture and taste. I'll be ordering more. I've been a customer for a long time. The salted peanuts are my favorite, and I'm never disappointed with the quality of the product. Wish the shipping cost were not so steep. Virginia Diner peanuts are the very best in all the land! Bar none!! We were given a can of your peanuts as a Thank You for getting rs mail while they were away! Have never had peanuts this good. When the can was finished, I ordered 4 more and they are now all gone! They are the best peanuts I have ever eaten. I run out because every time I order 4 cans, I give at least one away. Excellent product and I like the plastic top that keeps them fresh. Always good. This smaller size is quicker to use up than the larger one. Virginia Diner is the best peanuts I have ever had! Cannot eat any other kind after tasting these! The are crunchy & fresh! I am spoiled! Truly the best peanuts money can by. Enjoy every time I get them!!! You have the best peanuts in the world! This company is a winner! Peanuts as big as your little toe, and as crunchy as a corn chip. 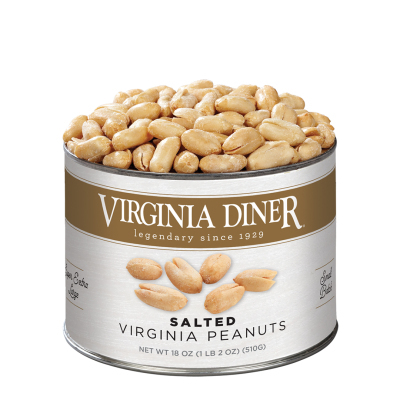 We always take these with us as hostess gifts- a hit wherever we go- especially with folks who have never tasted Virginia peanuts! These are the best peanuts available anywhere. Crisp, quality flavor in every single one of them in every can. We got them as a Christmas gift originally, liked them so much that we have ordered multiple cans in each order. We've never found such good peanuts! Love Virginia Diner. Ordering is easy and the products are delicious. The peanuts are always fresh and are good sized. I love to open a can when people are over and they usually end up being a customer too. These gourmet peanuts are delicious. Great quality and flavor of nuts. Great products. Have been ordering several times since we moved from Virginia to Las Vegas. Great gifts for friends and neighbors!!! Great Company, I give these as presents and the freshness & quality are always consistent! I have purchased these peanuts for almost 20 years. They are the best Virginia peanuts by far! They make an amazing gift but I always have to buy some for me too! I order items from here annually for Christmas gifts. I couldn't get to the Diner this year to shop so I tried online ordering. Delicious peanuts arrived right on time. Thanks! I have never had a peanut with such texture and snap. Addicting! You will never buy grocery market peanuts again! Great for gift giving. Found these at a specialty grocer in AZ and we can't stop getting them. No other peanut compares. The unique flavor and crispness, sets these classic Virginia peanuts apart from all the rest! Received 2 cans as a Christmas gift. We loved them and needed to order more. Our order was lost in shipment. Post office could not locate the 2 cans of peanuts that were ordered. I called called Virginia Diner customer service and the lost order was promptly replaced. I will be a repeat customer.